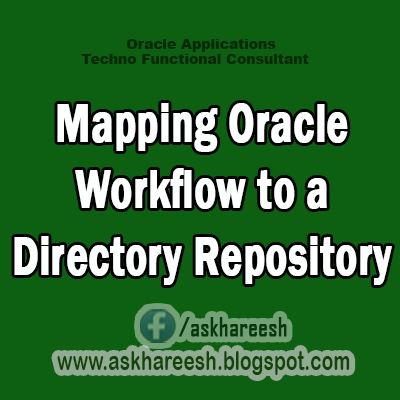 To map Oracle Workflow to a directory repository, map the three views—WF_USERS, WF_ROLES, and WF_USER_ROLES to the database tables in the directory repository selected. If Oracle Workflow is not stand-alone, but is integrated with Oracle Applications, you can map the roles to users and positions defined in the Oracle Human Resources modules. Oracle Workflow provides a seeded script that you can run to map the three views within Oracle Applications. The three views are mapped in the following way. WF_USERS is mapped to all employees with active primary assignments. WF_ROLES is mapped to all users listed in WF_USERS and to all positions defined as workflow roles. WF_USER_ROLES is mapped to the combination of WF_ROLES and WF_USERS. You can use these three local views to supplement the database tables in the directory repository.